We are all a product of our experiences and the memories that give us a sense of place and belonging. 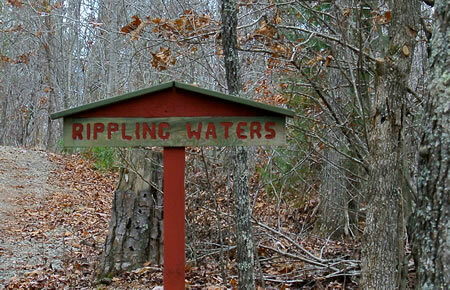 Rippling Waters was my favorite campsite at Camp Golden Valley in Sunshine, North Carolina. My friends and I spent a great deal of our time at Golden Valley, not just summers, but beautiful crisp fall weekends, cold winter nights and the warming days of spring. Golden Valley was a place to learn who we were, what we were capable of achieving and to dream of adventures yet to come. Golden Valley is part of the fabric of who I am today and remains in my memory as a beautiful landscape that colors each piece of my work. That bone deep appreciation for the natural world, learned as a child, continues to influence my choice of subjects for my artwork today. A shady path through the woods, newly opening spring flowers, still water in a mountain lake or watching the deer and squirrels in my back yard, each day brings a new experience to add to the memories that inspire me. Through this blog, I will share my thoughts on living a creative life and the inspiration as well as process behind my fabric and textile art. I hope that you will join me as I begin a new phase of my journey toward understanding how art shapes our everyday lives. Please view my gallery pages to see my work. Walk in the sunshine and stop to admire the small miracles along the edge of your path each day. NetQwik is a full service web design company based in Northern Virginia, Washington, DC and Maryland. We offer website design, ecommerce development, graphic design, digital marketing, seo, hosting and domain services.